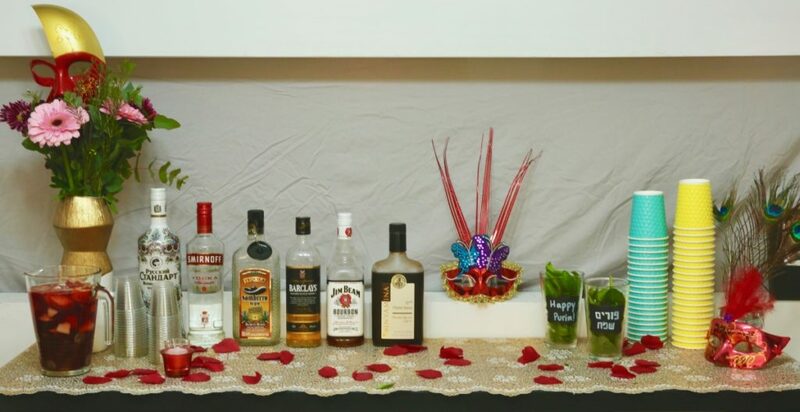 Purim was on Saturday night this year, so I decided to throw a Friday Night Dessert & Drinks Party before Purim itself. Saturday night would be way too stressful for me. I like to serve freshly prepared food, and there would be too little time to prepare after Shabbat and megillah reading so I thought Friday night was the perfect answer! Then the planning began. 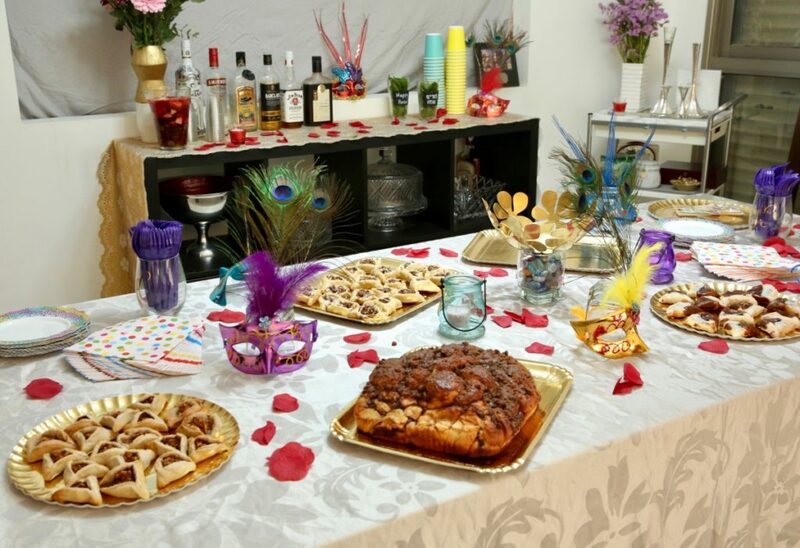 I figured that everyone would have real food at their Shabbat dinners, so a dessert and drinks bar would be the perfect fit. I went to my local paper goods store (think Amazing Savings) and after browsing their selection I decided to go with a very colorful theme. I felt like that would be a good match for Purim, since Mi Shenichnas Adar, Marbin B’simcha! 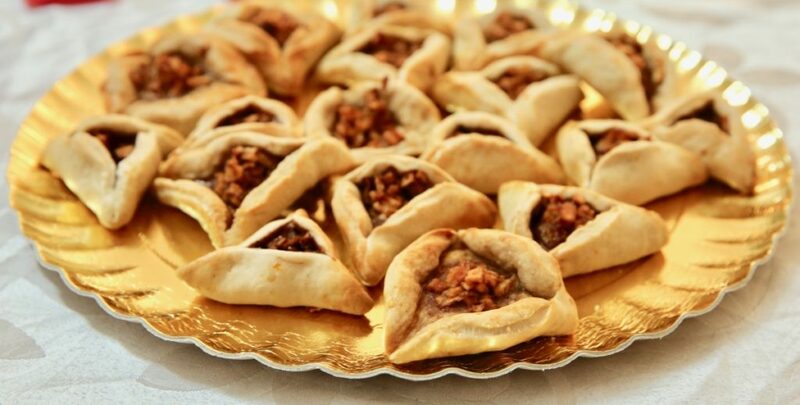 I came up with a list of hamantaschen that I wanted to make, including some of my own ideas and some of other food bloggers! I went with my strawberry shortcake hamantaschen and crepe hamantaschen, but instead of Nutella, I used Lotus cookie butter to keep it pareve. I also included Salt and Serenity’s cinnamon bun hamantaschen and Kitchen Tested’s Black & White hamantaschen, though I switched out the B&W cookie butter for homemade Oreo cookie butter because I couldn’t find B&W cookies here in Israel! 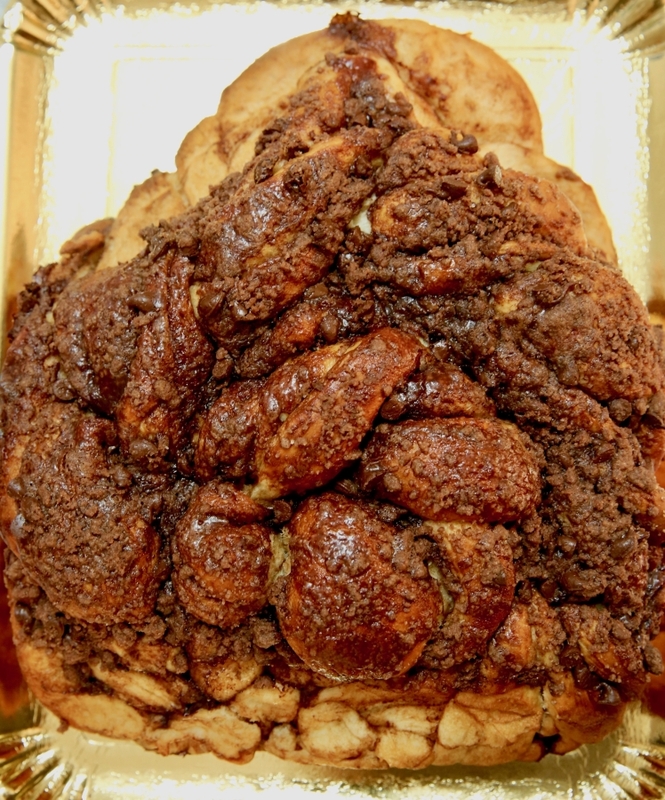 I also made a deliciously chocolaty babka using my challah dough in the form of a hamantash! It was divine! After making all my planned hamantaschen, plus my B&W popcorn (plated in little triangular cups!) I had some time to spare and turned my attention to drinks. I started to work on my mulled wine, and then I was struck with a brilliant idea! 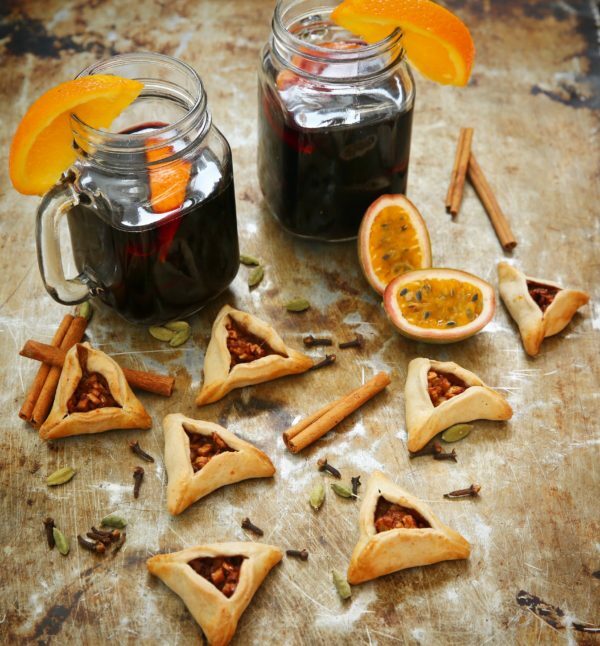 Why is there no mulled wine-inspired hamantaschen?! So with a few hours left until Shabbat, I set out to create this: Mulled Wine Hamantaschen. They turned out great! Next year I think I’ll go back and revise it a little, but in general I am very happy with my last minute results! Happy Purim everyone! In a large bowl mix all the dry ingredients including the orange zest. Add in the margarine and egg and mix. Adding both the wines and mix until the dough comes into a ball. Wrap in plastic wrap and let rest in fridge for at least 30 minutes. Meanwhile make the filling by mixing everything together in a bowl. Remove the dough from the fridge. Flour a work surface very lightly. Roll out the dough very thin! This is important. Most doughs tell you not to roll out to thin but for this one you want to roll out to around 1/8 of an inch, as thin as you can without ripping. Using a cookie cutter or the top of a round drinking glass, cut out circles from the dough. Gather the scrapes, roll out thin and cut out more circles until there is no more extra dough. Place around 1/2 tsp of filling in a circle, and fold up right away! Do not place all the fillings and then start to close up all the circles. The filling has juices and if you wait then the juices will run making it hard to get the dough to close. Transfer the hamantaschen to a parchment lines baking sheet. Using the egg white you reserved, seal up all the edges very well. Bake for 15-20 minutes until golden but not too hard! Enjoy with freshly mulled wine!